Less than 10 days left before Eid day, for all Muslims people, what have you prepared? First of all is must be heart, second is a good Pakistan clothes as a top, jeans or trouser (make it comfortable), sandals, sunglasses (it is important, because based on riset you will cry over and over again and don’t forget about outside sunlight, you will visit some homes of your neighbors one by one on foot, let’s say 20 houses *faint*), tote bag if it takes. 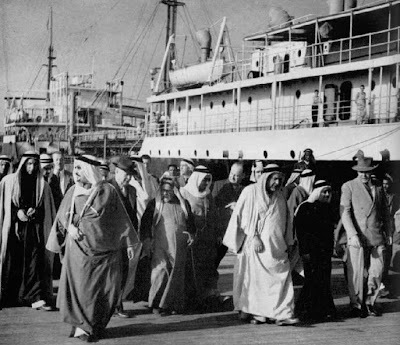 Picture above show that Arabian fashions is like Chinese Cheongsam, static and not much change over the centuries, but let’s say it as signature style. But as a young people who willing change the world, changing also the way you dressJ, still Gamis or not but the spirit of Islam or Arabian fashion still live on your look. 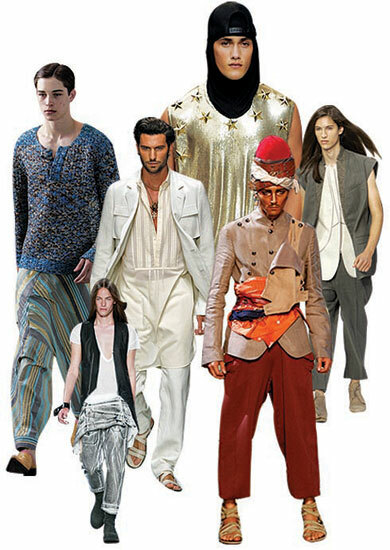 Men’s fashion Srping/Summer 2010 with a Middle Eastern inflection, from left: Issey Miyake, Rick Owens, Versace, Givenchy, John Galliano and Dior Homme. Back to the trends on Spring Summer 2010, some of the designers raised Middle Eastern theme, Versace and Galliano, Versace more into Bollywood but its ok, I am so into their Gamis (white sheer top) and very chic for celebrate this Eid day and white, you couldn’t agree more. No Galliano for Eid please, back to Spring Summer 2011, there are names like Damir Doma, Yves Saint Laurent (their hat is hit me), Rick Owens, Dior Homme, and lats but not least the spirit of sleeveless gamis on Neil Barett runway show, that could all be a style choice to have different look for this Eid. *give my 2 thumbs to Neil Barett Sleeveless white top. I really liked the black vest! A lot of my friends hate this trend but I actually like.. I would love to wear it on the streets.. Very daring and edgy.. This is a really fascinating post! I love seeing the influence of Middle Eastern culture on fashion! Middle eastern cultures are so inspiring ! Wow, loving the Middle Eastern influence on the runway!! It's very classy and stylish. Love the looks. Interesting cuts and inspiration source.